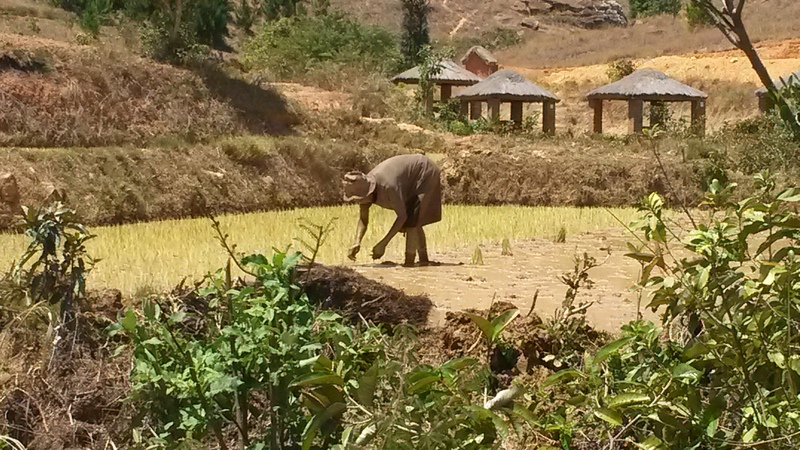 I immediately thought of Wageningen and multifunctional agriculture when I visited the Mila Soa farm (https://www.facebook.com/pages/Mila-soa-page-officielle/232818760177070 ) in Madagascar. Richard Rabetrano was showing me around. He is a local farmer and farmer organiser who is part of the leadership of the Eastern and Southern Africa Small Scale Farmers Forum (ESAFF – http://www.esaff.org/). Richard had asked if I wanted to see a farm with pigs, dairy cows and fish. When we arriv ed we parked next to an events hall that is used for weddings and other functions. The pigs and chickens are in sheds built on the hillside opposite the main part of the farm, I suppose they do not make the best accompaniment in sound or smell for your special day, whether it be saying I do or graduating from university. Most of the fish are tilapia and the farm is experimenting with new methods of hatching the fish eggs and different feeding regimes as well as adding more fish ponds. It was the dry season with crops only growing in the river valleys where there is enough water. 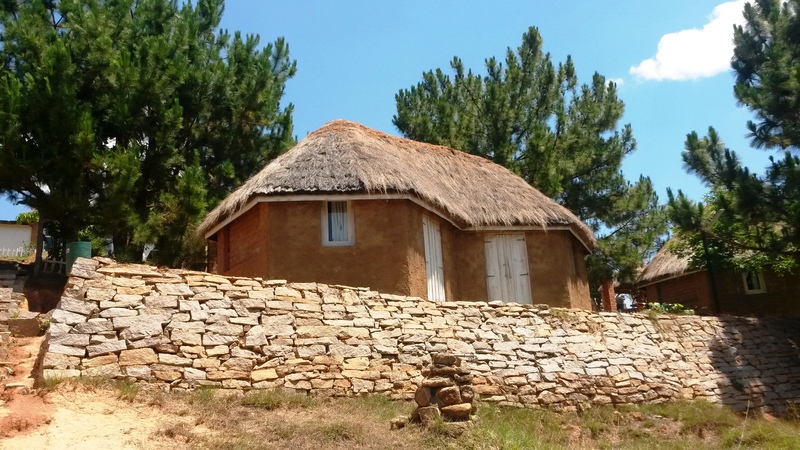 The fields around Mila Soa looked dry, but with the shade of trees and a swimming pool it is still a welcome get away from the bustle of Antananarivo. Picnic tables under thatched shade were by the basketball court, the children’s playground and near the river. 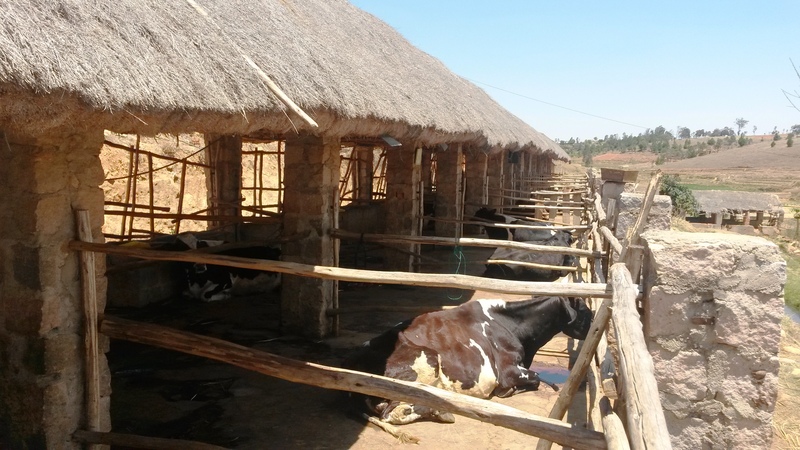 The dairy cows also had a thatched roof, quite different from Dutch dairy sheds. There are also small bungalows to accommodate visitors. An enclosure contained a variety of birds and guinea pigs. Earlier in the day we had visited other more typical small farms, including Richards, although due to a lack of water he was not able to plant dry season crops this year. These farms also had an element of multifunctionality. 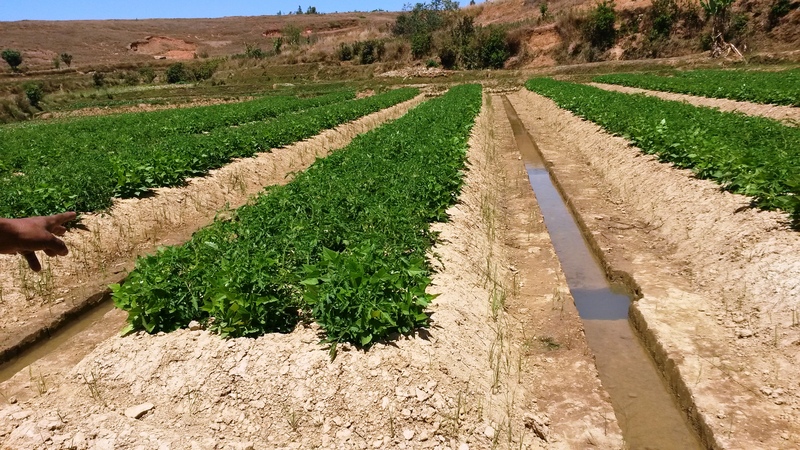 The land in the valleys was, with carefully constructed irrigation channels, being used to produce beans and other legumes as well as some potatoes, tomatoes and green vegetables. The other activity going on in many of the fields was brick making. The hard clay soil makes excellent bricks went burnt in large piles in the fields. These are used to build local houses or sold for construction in the city. Most of the fields, even the brick making ones, will be planted with rice in the rainy season. Richard explained that the brick making helped to lower the soil level in some fields so that they could be irrigated and that although you may need more fertiliser it would still be possible to get rice crops from the land when the rain came. This entry was posted in Agriculture, Multifunctionality and tagged Madagascar, Small holder farms by RSO-Guests. Bookmark the permalink.